This unique species is the only one within its genus. 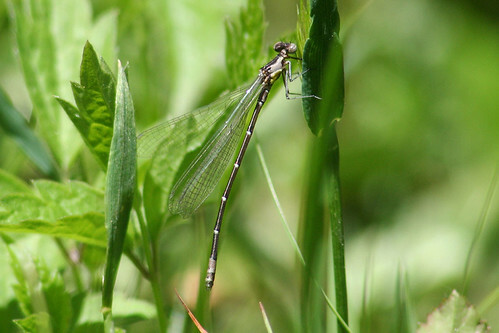 It is one of the Pond Damsels, family Coenagrionidae. 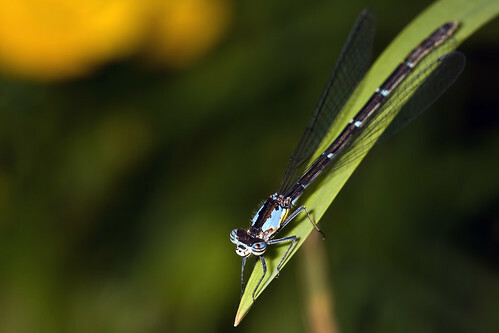 Some other genus in the family include the bluets, dancers, forktails, and red damsels. 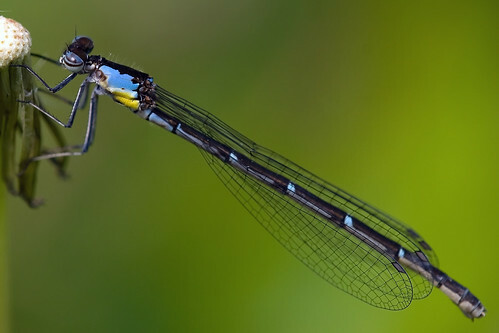 Most people would look at this damselfly and think that it was a bluet. If you take a closer look through, you will see that there are a few differences. For one, when the damsel is at rest it will hold its wings apart like a spreadwing would. 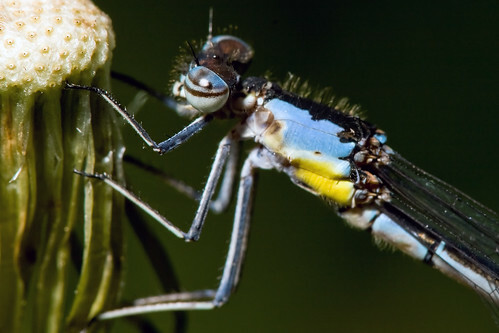 Also unlike any bluet, it has a patch of yellow on the lower sides of the thorax. Males have blue sides on the thorax with a lower yellow patch. Males also have segments 8 & 9 almost completely blue. In females and juvenile males the blue is typically replaced with a light brown or gray, but a blue form female does exist. If you would like to find one, you should search in vegetation around calm water at streams, clean lakes, and ponds in early spring. It has also been found in bogs and fens. My early date is May 26 an the late date is June 9. I have found it at three locations, the Jamestown Audubon and the pond at the Rodger Tory Peterson Institute in Chautauqua county and locations in Allegany State Park including Red House lake (in Cattaraugus county). such amazing photography Jeremy and love this profile of such a wonderful damselfly! Hope you are able to do some more of these post! A gorgeous insect! I hope to find one next spring! Nice post. I hope you will do posts like this for lots of species! It will help me learn my damsels and dragons! Thanks! Hopefully I will be doing more soon. This one has always been a favorite of mine; I hope you find it Patrick. This looks a gem of a damselfly. What clarity you have been able to capture! Just discovered your suprb blog and hope to back to learn more. -An Odontoholic from Sri Lanka. Finally someone that knows something about dragonflies. Is it possible to breed them as in captivity? Or to put it another way how do we encourage their natural reproduction?